The weather is finally coming around and yesterday the kids asked me if we could go biking this weekend. Sigh. Me: Yay, fun! We’re biking! Me: You’re fine! Let’s have fun! Girl: I want a snack. Me: Just wait until we stop and take a break. Me: It’s no big deal – he won’t bother you. Me: (under breath) #$&&*@ bee. (out loud) He’s gone now. Girl: Is it breaktime yet? Me: Fine, here’s a snack. Boy: Do we have chips? Me: No chips. We’ll get chips later. Boy: I don’t like these. Boy: That’s because you’re riding in that wagon thing. Youre not working. Me: Shut it. I’m the one doing all the work, so deal. (thinking) Oh My God, this cart is so freaking heavy. I’m dying. But it’s fun, by God. Girl: I like these, mom. Boy: Hey! She’s eating my snack! Me: You said you didn’t like it! Boy: Well maybe I do. Boy: Can we go back now? Girl: Can we go back now? Now, repeat this every weekend and you have biking with my family. But this season is different because the girl can ride her own bike. And I know that she will pedal 10 feet and then be too tired to go any further, adding to my misery. 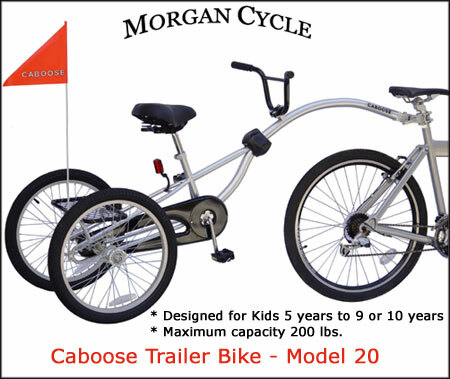 It’s a Caboose Trailer Bike by Morgan Cycle, and it will let her pedal, but we’ll be able to keep on going if she gets tired (because I actually DO like biking). 5 Minutes for Mom is giving one away – go check it out.